I'm a little late with this one, since I've prioritized other things lately, but now it is here. The gear list, excluding the bike is here. I will probably be kicked out of the lightweight community for this, since the total weight excluding the bike was 17.6 kg, but I'd like to point out that almost 5 kg of that was camera and bike specific gear. Anyway, I don't intend to go through all the details here. Instead I'll just give some random observations on what worked and what did not work. The most important part of a bikepacking trip is naturally the bike. I got the Surly Pugsley last fall and built it to be capable of unsupported trips for at least a week in both summer and winter. It works very well for this purpose. During the winter the fat tires give lots of floatation on trails and snowmobile tracks and in exceptional circumstances even on snow crust. During the summer the fat tires provide a sufficient amount of suspension in a mechanically simple package and the extra floatation is also useful in certain terrain. The internal Alfine gear system works very well and is not vulnerable to the same problems external derailleur gears are. If the Alfine breaks down it is impossible to repair in the field, though, but the Pugsley allows swapping to rear and front wheels, which could help in some cases. I have a 20 tooth fixed gear on the front wheel just for this purpose. I've equipped my Pugsley with a frame bag and both front and rear racks. The racks weight about 520 g each and the frame bag 300 g. This setup enables me to load all the gear on the bike itself, leaving the back free for a light slingshot type camera bag. With a badly herniated lower back riding with a heavy backpack is out of the question anyway. It is hard to find anything negative to say about the bike setup, except that it weighs about 5 kg more than a full suspension bike without any extra bags. It also rolls noticeably heavier on asphalt and to some extent dirt roads, but when the going gets rough there is no difference in rolling resistance. 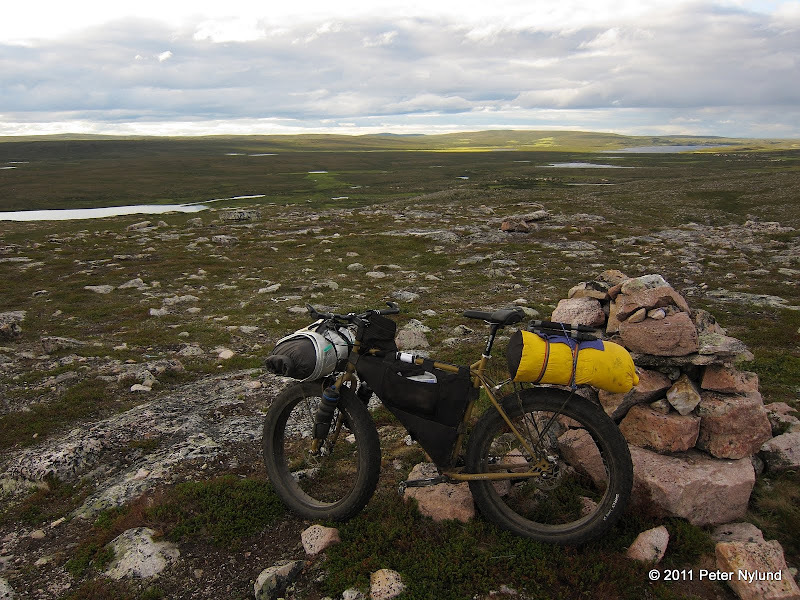 I would still say that a fatbike is the optimal bike for the Pöyrisjärvi region. I'm still very satisfied with the Tarptent Double Rainbow. This tent model is a good compromise between a tarp and a tent. In good weather it can provide a very open bug shelter and when the weather gets bad it can be closed down fully. It is also fast and easy to set up. The weight is 1150 g for this two person model, which is quite ok in my book. With the lightest possible solo solution I could save about 700 g in weight, but I really can't justify getting a separate solo tent currently. The Double Rainbow is big enough for me and one of the kids, which was one of the criteria for buying it. The sleeping gear was my old Beeline 900 sleeping bag weighing 600 g. I've used it in comfort in a few degrees below freezing, so a lighter solution could be possible for a trip like this, but I still think 600 g is quite ok. My home made fleece wine bag pillow is worth its weight (120 g), but the Prolite 4 Short sleeping pad is a little heavy at 520 g. The NeoAir Short sleeping pad I ordered via Partiovaruste just arrived and should be a better: It weighs 260 g, is warmer and pack down smaller (see the picture below). Now that the kids are accompanying me on more outdoor overnighters I could justify getting a new one, since the old Prolite 4 still gets some use. Otherwise I'm reluctant to replace existing gear that works perfectly fine for several reasons, one of them being trying to consume less for environmental reasons. 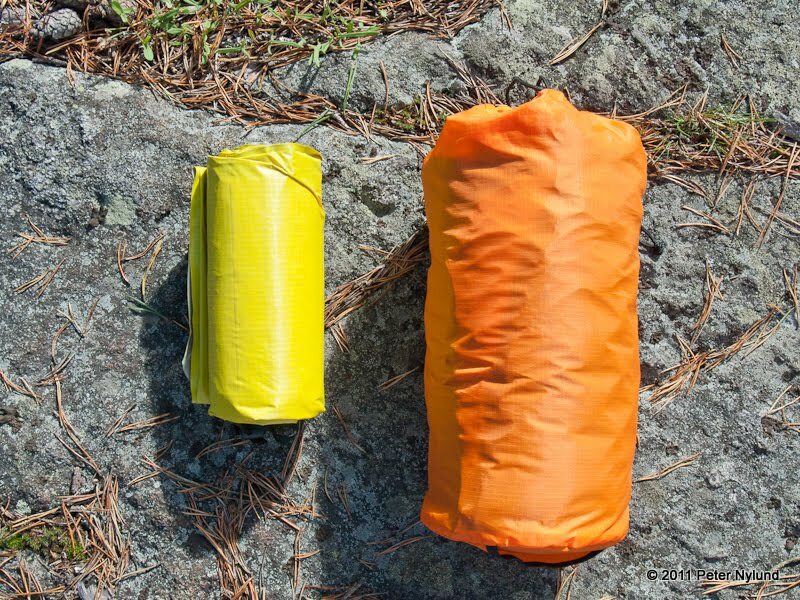 A last minute addition was the Kaira Extreme closed cell foam sleeping pad weighing 146 g, which is quick to use for short breaks and also gives structure to the drysack containing food on the front rack. 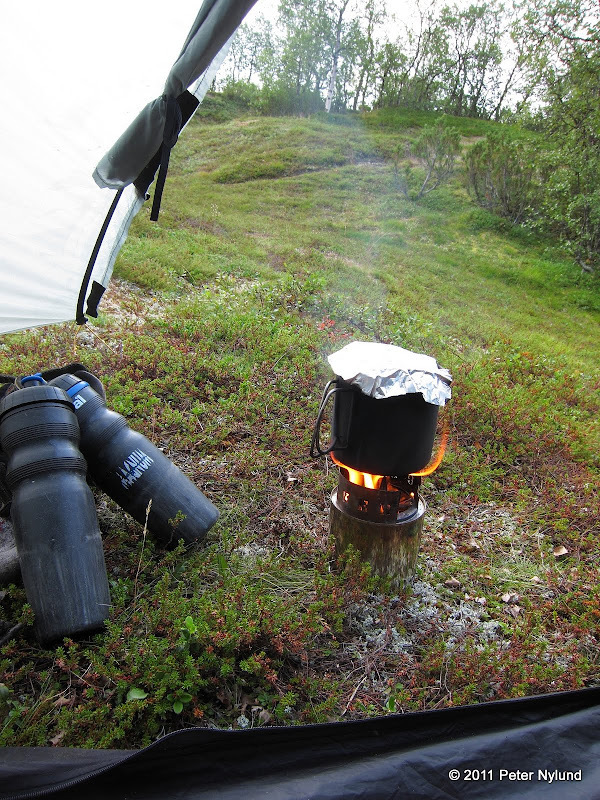 I relied mostly on the Norwegian Real Turmat series of outdoor food. It is superior in taste and functionality to the other alternatives I've used (the British Fuizion still remains to be tested). In addition to this, I had porridge for the mornings, which was ok for a few days, as well as some dried meat and beer sausage (I will bring more of these the next time). Müsli bars, chocolate and sports drink provided additional energy, but I still probably got only about half the amount of energy I was actually using up. The energy gels were a catastrophy, as I described earlier, and the French roast coffee made in the coffee press provided enjoyment in the morning and afternoon. The BushCooker wood stove worked great and will certainly be my choice in the future unless great amounts of rain is expected. In just a few minutes I gathered the twigs necessary to cook a full pot (900 ml) of water and contrary to what I've read, it could be used from within the tent. It was still far enough from the tent fly to be safe to use. There is not much to say about the clothes, except that everything worked just fine. The weather was warm and dry enough to require very little of the clothes. I used the Haglöfs OZO Pullover during a few rain showers but did not bring any rain pants and did not miss them either. I had a Golite micro-fleece type shirt with me for warmth, but did not use it. The Haglöfs Shield wind pants worked just as they should, as did the Montane LiteSpeed jacket. I also brought a pair of Sealskinz waterproof socks, which I had great trouble buying, but did not use them once. If the weather would have been colder, they would have been needed, though, since my feet were wet for long periods of time. I intended to document the trip fairly thoroughly both in still pictures and video, but this became harder after I lost the tripod head quite early in the trip. I had a fairly big DSLR, the Canon EOS 60D, with a fairly heavy 15-85 mm lens in the excellent LowePro Slingshot 102 AW bag. This bag is small enough not to cause the usual problems a backpack and is very fast to use. Just unclip one strap, swing it to the front, open the side compartment and take out the camera. In addition to this I had the excellent compact camera Canon S90 in the gas tank bag, which I could take out in just seconds. In practice I took about half the pictures with the compact camera. For self documentation purposes I had a small tripod with me, the Slik Sprint Mini Pro GM weighing 690 g. It is just stable enough for the DSLR. 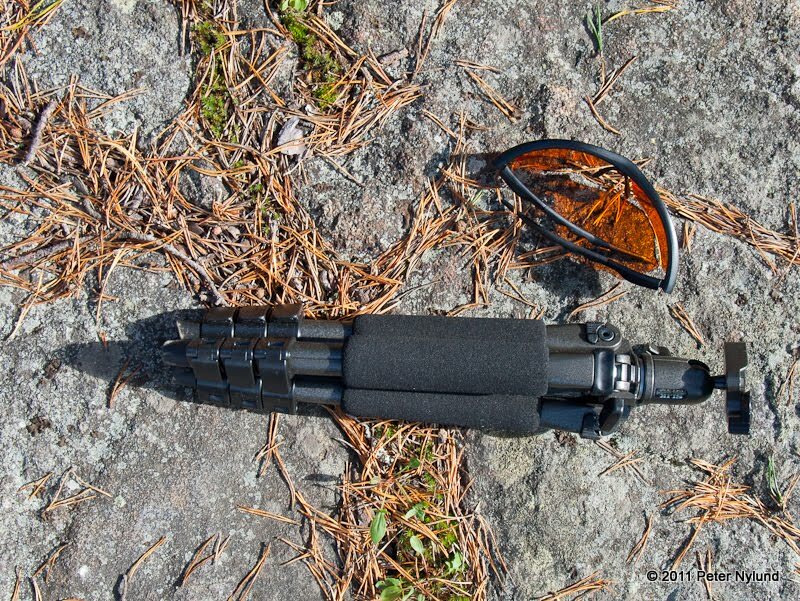 This tripod was the only item I had problems with, the problem being that the tripod ball head fell down somewhere on a trail near the Norwegian border. The vibrations probably caused it to come loose. Otherwise the tripod performed adequately, and I've since bought another one. During the trip it occurred to me that my camera gear was oversized for a trip like this, since photography was not my first priority. Looking at the pictures afterwards, I think the picture quality of the compact camera was more than good enough and for the most part the pictures of the DSLR were not of mentionably better quality. 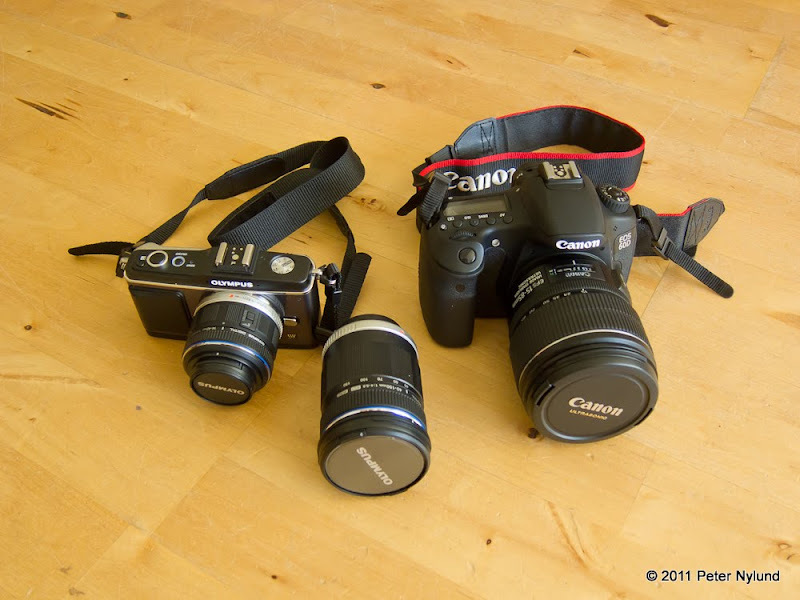 When I got home I started to look at other alternatives, and after having found a good deal in a local Rajala camera store I bought a m43 system consisting of the Olympus E-P2, 14-42 mm and 40-150 mm lenses, which together weight less than just the EOS 60D body. I've since sold the 60D with several lenses. I actually missed only two things: A spare spoke would have been nice to have and would have brought some peace of mind, when one spoke broke on the back wheel. The other things was a small binocular. There were a few northern birds I would have liked to look closer at, though I think I identified them with reasonable certainty. I've since bought a very light and small monocular, the Luger MM 6x18 weighing only 76 g, which should suffice for these needs. I've probably forgotten to mention something really important, so feel free to ask questions. The gear list should be at least 97 percent accurate, but might still contain some small errors. Lovely pictures again. What is a humektan, please? Sorry, I didn't specify that. Humektan is just an ordinary skin lotion.